MOGADISHU (HAN) February 1, 2016 – Public Diplomacy and Regional Stability Initiatives News. By: Jim Garamone. In the face of growing threats from the African continent, U.S. Africa Command has spelled out its theater campaign plan, officials said. The plan is built upon the foundation of the strategy promulgated last year by Africom commander Army Gen. David M. Rodriguez, officials speaking on background told reporters traveling with Marine Corps Gen. Joseph F. Dunford Jr., the chairman of the Joint Chiefs of Staff. 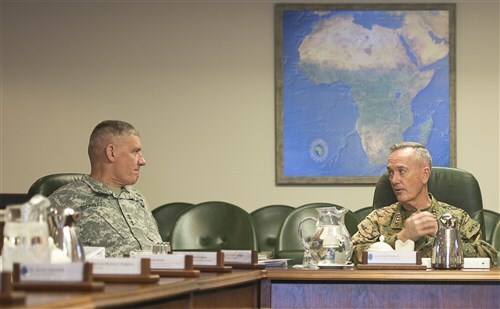 The chairman visited Africom’s headquarters at Kelly Barracks here Jan 4..
Officials said Africom’s campaign blueprint is a five-year plan with five lines of effort. The first is neutralizing the terror group al-Shabab in Somalia, officials said, and transitioning this effort from a mission led by the African Union Mission in Somalia to one in which the Somali government secures its own territory. The second line of effort centers around the failed state of Libya, officials said, adding that the effort focuses on containing the instability in the country. Officials said the third line of effort is to contain Boko Haram in West Africa. Fourth, officials said, Africom will focus on disrupting illicit activity in the Gulf of Guinea and in Central Africa. Fifth, the command looks to build African partners’ peacekeeping and disaster assistance capabilities, officials said. The command does have cooperative security and contingency locations across the continent, officials said, noting these are essentially “cold bases” that would only be used in the event of an emergency. In West Africa, Dakar, Senegal, is one of the cooperative security locations and U.S. forces used it during the Ebola crisis last year, officials said. Officials said the bases also allow the command to protect American lives and property in the high-risk, high-threat posts. There are 15 of those posts in Africa, officials said. The theater campaign plan starts with neutralizing al-Shabab, officials said. U.S. forces have helped to train, equip and supply AMISOM forces that have played a central role in bringing stability to Somalia, officials said. 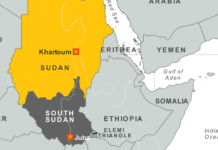 “Al-Shabab has been pushed out of most of the major population centers and is only a power in the Juba River Valley,” an official said. However, the official added, al-Shabab “is not a spent force” and it remains a threat — particularly in terms of targeted attacks against neighboring AMISOM contributors. Africom continues to monitor the al-Shabab threats to Kenya, Ethiopia and Uganda in particular, officials said. Officials said this is an indication of the power of the ISIL “brand” in the extremist world. ISIL, especially after its success in Iraq and Syria, is viewed by extremists as a winning team, while al-Qaida is viewed as having waning operational capabilities. Al-Shabab has been manhandled by the AMISOM troops and the mid-level and lower extremists see ISIL as its savior, officials said. Core-ISIL has not accepted the al-Shabab splinters as members of the caliphate, officials said. The Islamic State affiliates in Libya and Boko Haram in Nigeria have been connected with the extremists in Syria and Iraq for a number of years, the officials said. Boko Haram “officially” joined the terror network last year, officials said. But there has not been a significant shift of resources, people or even tactics, techniques and procedures to Boko Haram, officials said. The Nigerian-based terror group “is a self-sustaining entity,” an official said. Terrorists in East Africa need material and resources from ISIL, but they are not going to get it, officials said. Core ISIL is hurting itself — the Islamic State has lost Beiji and Ramadi in Iraq, it is under assault from the Kurdish peshmerga and the Syrian anti-ISIL coalition is making progress, officials said. The coalition oil campaign is also having an effect on ISIL’s source of wealth, officials said. Strengthening the AMISOM force and its capabilities will also serve to strengthen the Somalian government, officials said. Containing Boko Haram is another factor, officials said, noting that Africom is working with local partners — including Nigeria, Chad, Cameroon and Niger — to contain the terror group. French and British officials are also working with local allies and the command, the officials said. Libya is a challenge, officials said, noting “increasing bifurcation between moderates and hardliners.” The weak central government allows the space for ISIL to build a safe haven that acts as a nexus for terrorist operations in northern Libya, officials said. This has quickly become more than a simple problem within Libya, as the group has launched attacks in neighboring Tunisia, officials said. Africom has also seen some foreign fighters going into ISIL in Libya, officials said. Africom is looking to contain ISIL in Libya and degrade it, said officials, who estimate there are roughly 3,500 ISIL terrorists in Libya.